Well…that was fun in a “struggle and overcome adversity” kind of way. Actually my adventure during the 2013 ARRL UHF Contest wasn’t quite that bad…ummm, most of the time. My preparations for the contest essentially lasted a year. You see, last year I picked up a 1296 Mhz FM handheld transceiver just days before the UHF contest. It made the contest even more enjoyable and gave my score quite a boost. The final score of 5,136 produced a second place finish for the U.S., just 300 points behind JK, K9JK. I was determined to add 903 MHz to the mix for 2013, and be capable of all modes on 1296 MHz. The only problem is that there is a shortage of 1296 MHz transverters on the market because Down East Microwave (DEM) has stopped producing them either assembled or in kit form (at least for 2 years now). So over the past year, I watched Ebay closely. I checked out the QRZ swap meet ads almost daily. Whenever a ham mentioned they had a transverter during a QSO, I asked if they wanted to sell it (yeah…I was shameless about it). Occasionally a 1296 MHz transverter would show up on Ebay, but the good ones always sold for more money than I could part with. For 33 cm, I was getting ready to order a DEM 903 MHz transverter kit in January when Jim, K7ND, offered a SSB Electronic 903 transverter for sale (similar to this one). I snapped it up. In the following months I picked up from Ebay the elements + hardware (everything but the boom) for a 33 element (12′) 903 MHz loop yagi. I purchased locally a second-hand 24 element (6′) 1296 MHz loop yagi. I also found a 18 Watt 1296 MHz D.E.M. amplifier on Ebay. Oh…I also picked up a Kenwood TK-981 commercial 900 MHz FM rig. I figured it was a long shot that anyone would be on the FM portion of the band during a contest, but the radio was inexpensive, and satisfied my need to cover all bases. Finally, it happened. An unassembled DEM 1296 MHz transverter kit was listed on Ebay. I received the virtually unopened kit at the end of June. As it happened, July was a busy month for me with the CQ contest and other obligations. Days before the UHF contest began, the transverter was at the testing stage. Everything seemed to check except that the local oscillator would not oscillate. Ughhh! I had to give up on Friday at noon. My fruitless persistence made the rover installation a bit rushed. That is what led to some frustration during the contest. So, I would be active on four bands, but not all mode on 1296 MHz. The up side is that I have clear objectives to achieve for next year…. I did have antennas built and mounted on the Rover a few days in advance. Being an optimist, I counted on having all four bands (223 MHz, 432 MHz, 903 MHz, and 1296 MHz) both SSB/CW and FM on board. The “antenna farm” included a (seemingly absurd) 12 yagis and two verticals for four bands (+ 2 meters for coordination)?!? Verticals for 222 MHz and 432 MHz can be seen as well. In retrospect, the 2 meter antenna was worthless. It got in the way and slowed me down. I never used it, if only because my 2 meter rig is also the transverter rig. That brings up…. Next is a TE Systems 2212G amplifier, 100 Watts on 222 MHz. Then there is an RF Concepts 4-110 amplifier, 100 Watts on 432 MHz. And below that is a Kenwood TS-480SAT used as an IF rig for 222 MHz. Lots of antenna switches to switch between a mobile and fixed configurations. My plan was to start out north near the CN87/CN97/CN88/CN98 grid intersection and work my way south to the CN87/CN97/CN86/CN96 grid intersection for Saturday. I would stay in a motel in Centralia, WA for the night, and get up bright and early to head to the CN86/CN85 border for Sunday. What I didn’t like about this plan is that there is no visit to Ocean Shores, WA, where I would activate CN76 and CN77. I could have gone there instead of CN85/CN86 and that would have given me an extra grid. 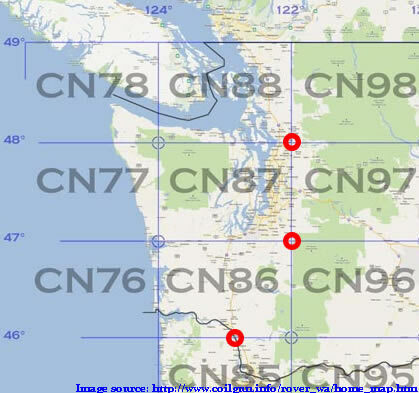 But, I thought my chances of maximizing 903 MHz and 1296 MHz QSOs would occur by going to CN85 near Portland and revisiting CN86 around the same place. As it happened, I made no 903 MHz or 1296 MHz QSOs on Sunday, although Sunday was modestly productive on 222 MHz and 432 MHz. Still, going to CN76/CN77 might produced a little better score. For once, I wasn’t rushing to get out of the house on Saturday morning. The first thing I did was head to the airport in Snohomish to pick up a GPS system that I left in my plane. The stop was, more or less, on the way to Mt. Pilchuck. I’d never been to Mt. Pilchuck before. I was aware that the “standard” rover/portable spot can be difficult to find, so I had a GPS route mapped right to the spot. The road got pretty bad in places, and I was very glad I wasn’t trying this in my econobox car. As I rounded the corner to the The Spot, I caught sight of some long aluminum pieces up in the air! Somebody else was already here! Mike and I had briefly met before, but it was my first time interacting with him one-on-one. In the 20 minutes we chatted before getting down to business, I learned a lot of things, including the probable cause for the lack of oscillation from the 1296 MHz transverter. I was enjoying our conversation so much that I didn’t get started until 10 minutes into the contest. I was feeling disoriented: a new location, a new set-up, and lots of little problems for the first couple of hours. But I managed a respectable 9 QSOs on 222 MHz and 6 QSOs on 432. Eric, N7EPD, was my first ever QSO on 903 MHz (not counting cordless phones). I also worked Mike, W7YOZ and K7MDL with the SSB Electronic transverter. Cool! On 1296 MHz, I only managed to work Eric and Mike. Unbeknownst to me, the amplifier power plug had come loose. So, I was putting out one watt instead of 15W or so. I left only a few minutes behind schedule for Lake Stevens. At the high school I got down to business until I started getting indicators of low voltage. The rough roads had caused my second battery to disconnect from the truck charging system. Back at it, for some reason 222 MHz wasn’t working for me. There was a lot of noise on the band. Eventually I discovered that the front end of the Jetstream JT220M had gone RF deaf (or not…see the update below). Huh…that radio has been in much more hostile RF environments without even flinching. Why it decided to die at this point is a mystery. No big loss, however, the Elecraft XV222 transverter would do double duty on 222.1 SSB/CW and 223.5 FM for the rest of the contest. That said, 222 MHz was still lousy in this spot using the transverter for SSB or FM. Mike, KD7TS, had suggested an alternative CN88 spot that I will try for the next contest. I only managed 4 QSOs on 222 MHz. 432 MHz was much more productive with 9 QSOs. KD7TS was the only 903 MHz contact, and he and Gary, WA7BBJ/R, were my only 1296 MHz QSOs. Gary was in motion at the time, so kudos to him for making that contact! My next stop was a 3,100′ mountain peak near Wilkison, WA. Dale, KD7UO, had told me before the contest that he might go to this location. But during a QSO in the contest he mentioned that the gate to access the forest service road was locked (even though the web site said it was open!). So, instead, I headed for a 1300′ spot on Mud Mountain near Buckley, WA. Most of the nearly 2 hour drive to this location is through CN87. I tried to maximize on this time by using the front antennas, and met with modest success. I took a slightly longer route to the location, but one that kept me out of a large valley south of Seattle. This map shows three routes through the area south of Seattle, heading to point B. The central route on HWY 167 is through a deep valley and has rarely yielded any QSOs at all. The eastern-most route, HWY 169, is somewhat better, but there is still a long dead zone north of Maple Valley. The western-most route, which I’d never used before, kept me on Interstate 5 for most of the trip, and at higher altitudes on the southern part. I believe that helped out considerably. I managed two 903.1 MHz SSB QSOs, but one of the great surprises and joys was catching Brian, KE0CO, on 927.5 MHz FM! Brian is in W. Seattle, and had I taken I-405 instead of I-5, this QSO wouldn’t have happened. In addition to those three 33 cm QSOs, I got four 222 MHz QSOs and seven 432 MHz QSOs. Mud Mountain was somewhat productive. I didn’t work anyone on 1296 MHz (unknown to me, I was still only putting out 1 watt). I worked four 903.1 stations, and also Brian, KE0CO, and Tom, KE7SW, on 927.5 MHz FM! Nine 432 MHz and six 222 MHz QSOs happened as well. It is just shy of an hour to the next spot in CN96, but the route goes through some pretty “RF fertile” CN87 and CN86 territory. The station seemed to be working pretty well as I left CN97, so I was more aggressive about making QSOs in route. In CN87, I snagged two more 432 MHz and three more 222 MHZ QSOs. The CN86 part of the trip is 15 minutes of rough gravel (and sometimes treacherous) road that is well elevated over the Puget Sound region. In that time, I worked a eight 432 MHz stations and three 222 MHz station. And then there was Brian, KE0CO, on 927.5 MHz FM! The next hour in CN96 I worked scarcely more 432 MHz and 222 MHz stations than I did in 15 minutes through CN86. But this 3,200′ perch was excellent for the higher bands. I worked three people on 1296 MHz, including Mike, KD7TS, way up there in CN98. I made three QSOs on 903 MHz, and worked Brian, KE0CO, and Tom, KE7SW, on 927 MHz. Because I had worked so many stations in transit through CN86 already, I limited my stay at this spot to just 25 minutes. I focused on the upper bands, and made two QSOs on 1296 MHz and one more 903 MHz QSO with Eric, N7EPD. And I picked up Tom, KE7SW on 927 MHz FM! I could hear Mike, KD7TS, quite clearly on 903 MHz, but he couldn’t hear me. It was just after 10pm when N7BUS showed up on 432 MHz. I worked him, packed up my antennas, and then headed 1000′ back into CN96 to work him again. About 30 minutes after that, I was set up in CN87 at the bottom of Mowich Lake Road. It was almost 11:00pm (local) and few people are on the air at that time. I did work Eric, N7EPD, on 903 MHz. That was my last QSO of the evening. I had an hour and a half of driving to my next stop—a Motel 6 in Centralia, WA. The Motel was unbelievably crowded and busy for 1:00am. A crowd of young men were partying on a 2nd floor balcony and were curious about the antennas. “Are those linear antennas?” asked one partier. I figured they were volunteer security guards, so I took a minute to explain and told them I would return for more questions after checking-in. The alarm sounded at 6:00am, and I was back on the road at 6:30am, for an hour trip to a spot in CN85. The only QSO I made en route was a difficult CW QSO on 432 MHz with Bruce, KI7JA. His signal went from S8 to S0 as I sped down the highway at 70 MPH and, apparently, my signal was doing the same. Bruce later mentioned that each time I sent my grid he got CN8… and I faded out. We eventually completed. I was set-up just after 7:30am on Green Mountain, and chatted briefly with Larry, the property owner, who had stopped by (I’d called him before the contest to let him know I was stopping by). As I expected, I had excellent paths into both CN85 and CN87. I made nine QSOs into CN85, turned my antennas around and worked five people back in CN87 plus Mike, KD7TS back in CN98. The only disappointment was the lack of QSOs on 1296 and 903 MHz. When things dried up in CN85, I headed to my last stop, about 20 minutes north and back into CN86. I arrived and got set up with an hour remaining in the contest. Oddly, I worked few stations in CN85. Most QSOs were back into CN87, and I worked VE7FYC in CN89 on 432 MHz and 222 MHz. That makes a total of 15 grid-band pairs. To that we add seven multipliers for the grids activated for a total of 22 multipliers. The final score is 11,022. It was one hell of a run, really. I, essentially, doubled last year’s score of 5,136. I struggled a bit with equipment–particularly 903 MHz and 1296 MHz, and lost one radio (dedicated 223.5 MHz FM rig). But making a bunch of easy QSOs with Brian, KE0CO, and Tom, KE7SW, on 927.5 MHz FM made up for it all. I started out with low expectations for the 927 MHz rig. The other pleasant surprise was the excellent results I felt was obtained from the 432 MHz LFA antenna that was built a week before the contest. Get the 1296 MHz transverter completed and working. More power on 903 MHz. The ~5 watts just didn’t cut it. Better transverter management. I have nearly completed a PICAXE-controlled sequencer that will allow for better switching between 2m, 432 MHz, 903 MHz and 1296 MHz. More reliable cabling. The rough gravel roads can shake loose Anderson Powerpole connectors from my homemade junction boxes. Something must be done!. Ditch the 2m yagi. It got in the way, and I didn’t use it. Better headset. RF was getting into and distorting my audio on 222 MHz and, perhaps, 432 MHz. Something must be done. It was quite an adventure….I can’t wait to do it again! Update (13 Aug 2013): The Jetstream radio is not dead! Here is what happened. I tuned it for 223.5 and set the frequency lock. Despite the lock, the frequency drifted anyway. I am not sure why it does this, but it isn’t the first time. The way the radio was installed, the frequency display was not easy to see, and I didn’t think to check it.